Industry leaders and policy makers have met in the Kazakh capital city of Astana to discuss the contribution of the tourism sector to reducing carbon emissions. The Tourism and Future Energy: Unlocking low-carbon growth opportunities conference was a joint initiative of Astana EXPO 2017 and the World Tourism Organization (UNWTO) with the support of the Ministry of Culture and Sports of Kazakhstan. The event, held in the framework of the International Year of Sustainable Tourism for Development 2017, was designed to advance the commitment of the tourism sector to the global climate change agenda. 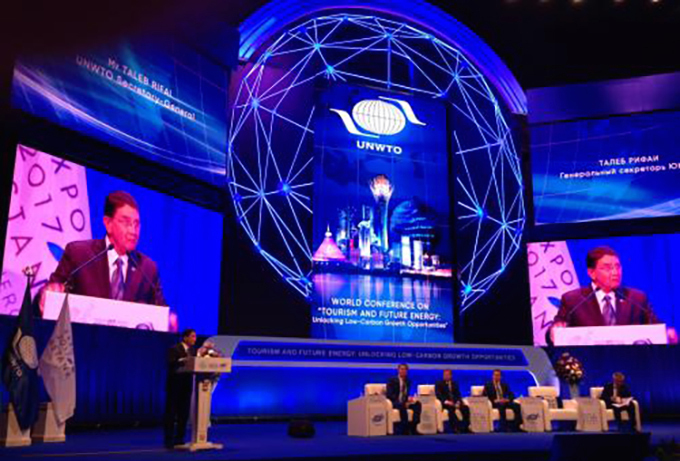 UNWTO Secretary General Taleb Rifai said: “One of the fastest-growing economic sectors nowadays, tourism represents 10% of the world’s GDP, 7% of global exports and one in every ten jobs. But with growth comes responsibility as we work towards building a better future for a people and planet of prosperity and peace.